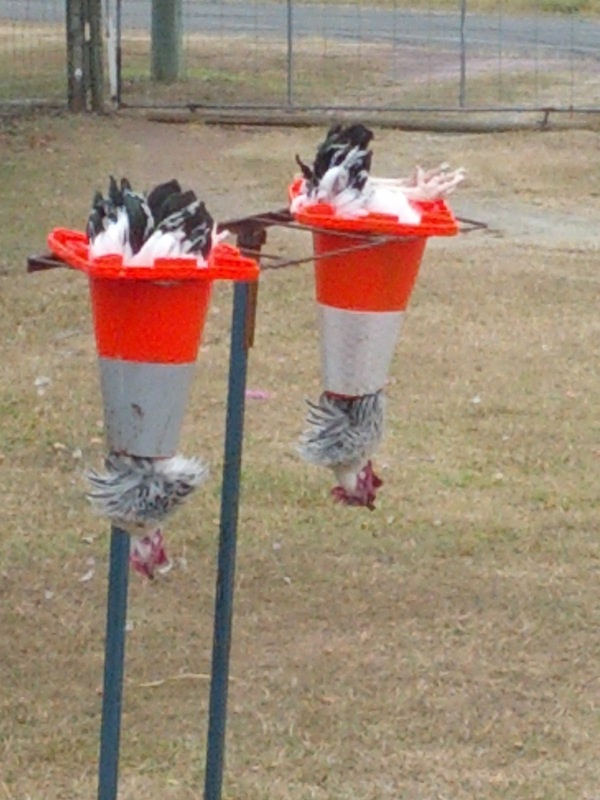 Sunday was D-day for the roosters and ducks (drakes). Having advertised them for sale and successfully selling one pure Sussex rooster and 1 drake and one hen from the ducks, it was time to deal with our excess birds. Now this is never a pleasant process, but I do stand by our decision to raise our own food. 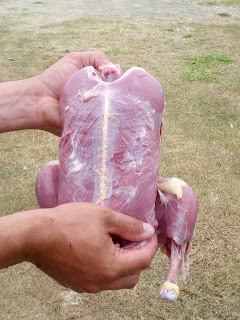 This, as meat-eaters includes our poultry. As a matter of hatching and raising chicks for layers, we accumulate roosters. We also (as we keep and raise ducks) have an ongoing source of ducks. However this does mean we have to deal with the excess livestock to fulfil their purpose and fill our freezer. These however were our first batch of poultry, hatched and raised here. The 3 roosters were now 20 weeks old and the now 10 week old ducks (males at least) were growing rapidly, as was their appetite. So whilst we have reared and culled our own chooks in the past, these were the first we had hatched and our first ducks full stop. As with our previous birds, we set up our temporary station, cleaned and set up the table, knives, poultry scissors and bucket of water. Our station consists of a stand and 2 cones. I have seen/read a number of ‘effective’ and ‘humane’ methods of killing poultry. 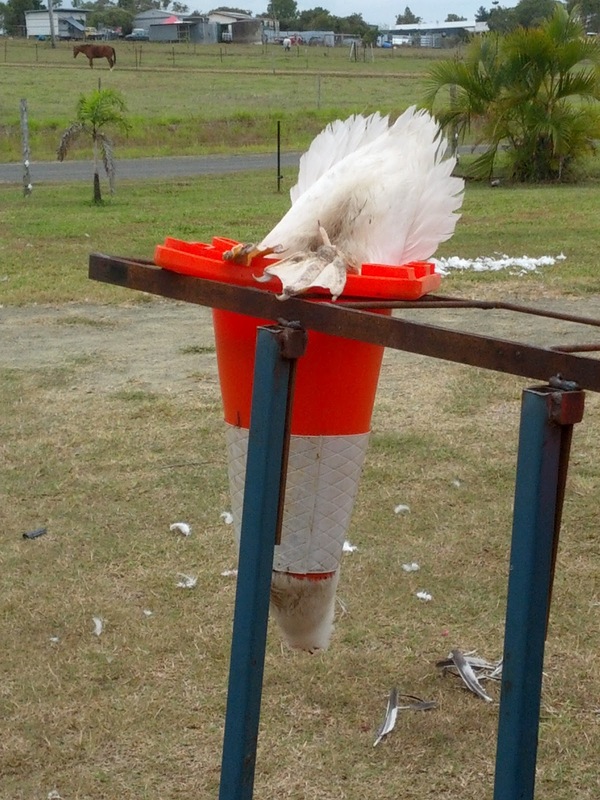 But a number include the use of a ‘cone’ shaped item and either cutting the throat or in some cases the head off and bleeding the bird. The cone helps minimise the movement and (hopefully) stress. We do try to keep the kill as clean as possible, as we do not want to put the birds through any more than we have too. And stress itself affects the meat, which in turn defies the point in doing this. We had in the past, attempted a technique from a Butchery book that involved piercing the brain/nervous system through the beak, before bleeding. It is supposed to be instant, however we were unconvinced. As it was awkward and if you were to do it incorrectly, then surely you were putting the bird through more pain/stress. So we have since opted for the more direct approach. I guess regardless of how it is done this is the part of the process I struggle with the most. Once they are dead I can process the bird; skin and gut, I guess as it becomes a matter of wanting to respect the life you’ve taken and not wanting to waste it. I know many would view my stuggle to be over sensitiveity, and other would question why do it then? And more so why document it? But I guess I will always struggle with my meat eating philosophy and my animal loving instincts... I hope I never change. As I don't hink (or hope) I will never be complacement about taking a life. And will therefore want to respect and make the most of any meat, all meat, but especially those we rear. Some may also question our method of feathering. As I have documented in the past that we choose to skin our birds, for time and health reasons. It's more time efficient and whilst many argue that the skin is the tasty part, I remove it whilst or after cooking anyway. So might as well save ourselves the extra work. I will admit skinnin the ducks was far more work than the chickens. As without going into too much detail, the skin was alot tighter to the meat and I needed to gentally coax it way with the knive, also the layer of fat under the skin was initially baffling. But persistance was key. Result a stocked freezer-3 chickens weighing 1.3kg, 1.6kg and 1.9kg and 6 ducks, the smallest being 1.1kg, all the others being 1.4-1.6kg, some duck livers for making pate. And some very well fed dogs for some day to come. The smallest bird was the larger of the younger birds we were raising. We still have another, which was much smaller, 2 that are still in that awkward yellow fuzzy stage- one I believe is a boy, the other could be a girl as ‘she’ is smaller. However this could purely be down to her lameness and ability to complete for food. We also kept the only other hen (other than the one we sold). Matt decided as they were our first ducklings he wanted to keep one and as she was the only girl it wouldn’t be as if we were increasing our resident numbers too much. His reasoning being the females are drastically small and he was worried she wouldn’t be carrying a lot of meat. To be honest I would have to agree, as she would have been smaller than the youngest male. So a reprieve for her at least.